Each weekday morning when I’m in the country I catch the 7:38 from Bicester into Marylebone. It used to be the 7:52, but Chiltern Railways changed the timetable a couple of months ago so that I could reach work by 9:00am. Very kind of them. 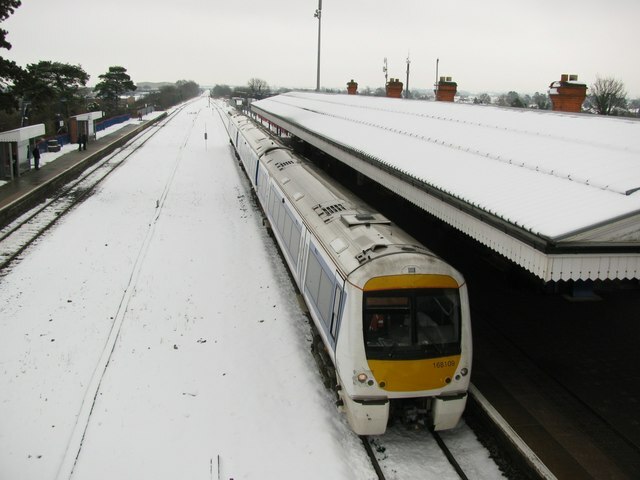 For those that don’t know about commuting on Chiltern Railways, I thought it might be helpful to provide some advice on appropriate behaviour for anyone intending to join me on the platform on an icy morning… I’ve designed these rules after watching my fellow passengers and learning from the excellent role models that they have proved to be. The golden rule: Think of the train as an extension of your home. When the train arrives and you wish to get on, it makes sense to position yourself square in front of the nearest set of train doors. At Bicester, make sure that you cluster around the second lamppost from the front of the platform. This will mean that the doors of the 7:38 second carriage will end up being in exactly the right place. Other passengers may wish to get off, but don’t worry. They’ll find your enthusiasm for the train they’re desperately trying to leave endearing. And anyway, what sort of people want to get OFF a train at Bicester at 7:38 in the morning? Once you have managed to fight your way past the passengers getting off the train, make sure you sort out your bags and remove any extra layers of clothing you might wish to before you get settled into your seat. There’ll be no time for all that once you’re underway. In particular, ignore anyone tutting or trying to get past you to the very few empty seats that might still be available. Luggage is best kept within reach and thankfully each train seat comes with a seat-shaped table for storage of personal belongings. If you have a lot of luggage, it can be haphazardly tossed into the racks at the ends of the carriage as you get on the train. If the train becomes rather busy, make sure you have something to put on the seat-shaped table next to your seat, lest a newcomer to train travel come along and mistake the table for a spare seat. This is particularly important if the train is due to make an extra stop at Beaconsfield. The middle of some carriages have extra tables and seat-shaped tables for the lucky lone traveller who gets there first. Some passengers may have forgotten to bring a personal music or video playing device along for the trip, or worse, be too poor to afford one of their own. They’ll doubtlessly be delighted should you choose to share your own music, or even better the sound from a video over a loudspeaker. This is particularly appreciated in the carriage marked with ‘Quiet Carriage’ signs. Travelling on the train out of Marylebone, with an extra call at Wembley Stadium on a weekday evening on a match day is a popular way for many individuals who usually travel by car to spectate at sporting events and also indulge in alcohol. It is only natural that other passengers will be curious about your team allegiance. Loud, inappropriate bellowing will serve to enlighten your curious fellow travellers. Other train passengers may not have children of their own and will undoubtedly appreciate the opportunity to experience parenthood as you sit back and let your children climb over them and fight with each other in the aisles. Likewise, nothing helps drown out that nasty engine noise quite as well as forty minutes of a baby crying whilst being ignored by his or her parent. Should your train run out of seating space, you may have to stand. To make the best of a bad situation, standing passengers squash into the ends of the carriages to form impromptu mosh pits. Standing in the aisles of the carriage is seen as a sign of weakness. Marylebone has automated ticket barriers, which have robbed many people of their jobs as station staff. Naturally passengers are against this and in solidarity shun the many automated ticket barriers in favour of everyone entering and exiting the station through the same solitary staffed barrier which was intended for use by passengers with wheelchairs/crutches/prams/large luggage or bicycles. In addition to this, many passengers express their preference for human staff by asking this lone barrier attendant for timetabling information which is readily available on the many automated screens.